So as I'm sitting here, writing this post, I have two little girls sleeping on my living room floor. Last night my nieces spent the night and I was reminded how fast past and chaotic an evening for all you mommas and daddies can be. That's why I'm so excited to be sharing so many easy, one-pot meals and sheet pan dinners. Y'all LOVED Monday's One-Pot Philly Cheesesteak Pasta Recipe and today I think you'll equally enjoy this Robust Garlic Chicken Sheet Pan Meal Recipe. 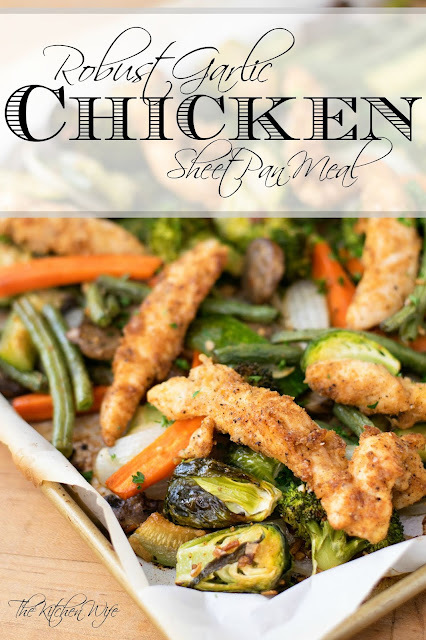 This Robust Garlic Sheet Pan Meal is PACKED full of veggies. I used what I had in the fridge, but what's good about this recipe is you can use whatever you and your family will enjoy! Place the chicken into a mixing bowl. To that bowl of chicken you will add the onion powder, garlic powder, paprika, salt, and pepper. Drizzle in a little extra virgin olive oil, about a tablespoon. Toss everything together until the chicken is coated in the oil and spices. Now in a small bowl (or measuring cup) combine the 1/2 c extra virgin olive oil, onion soup mix, and garlic. Now, on a parchment lined baking sheet, place your vegetables in a single layer. Drizzle the onion soup mixture over the vegetables. I'm tell you, this onion soup mix trick is a GAME CHANGER when it comes to roasting your veggies! Give the vegetables a toss so that everything is coated in the marinade. Place the chicken on top of the vegetables on the tray. Place into the 425 degree oven and bake for 30 minutes. I actually went in at the 15 minute mark and gave everything a little stir. 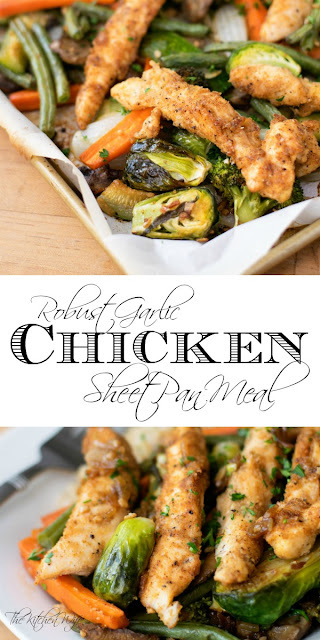 And there you have it, a gorgeous Robust Garlic Chicken Sheet Pan Meal. 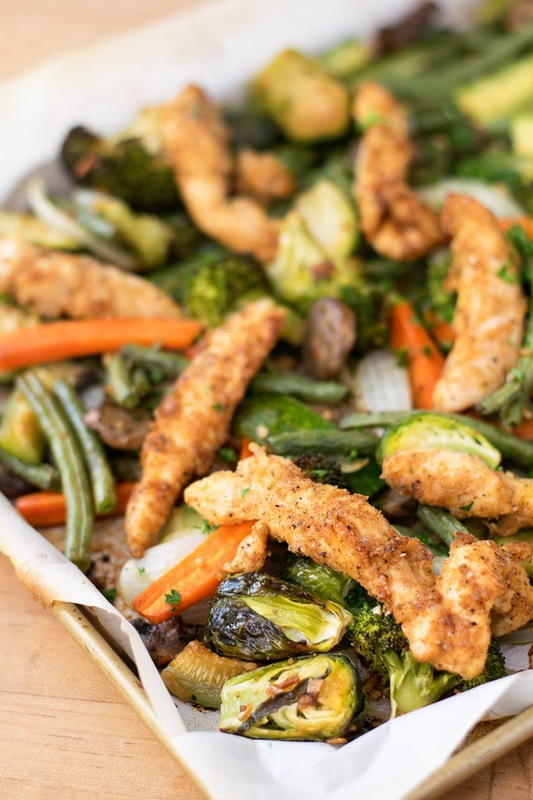 Though is may seem a little humble, the flavor that the chicken and vegetables pack is out of this world! I served this with a side of brown rice, but to be honest it is a full meal ALL on its own. I know you are your family are going to love it so get in the kitchen and make it TONIGHT! Place the chicken into a bowl and add the onion powder, garlic powder, paprika, salt, and pepper. Drizzle with a little olive oil and toss until the chicken is coated in the spices. In a separate mixing bowl combine the onion soup mix, garlic, and 1/2 c of olive oil. Mix everything together. Place the vegetables onto a parchment lined baking sheet and drizzle the onion soup mixture over them. Toss everything together. 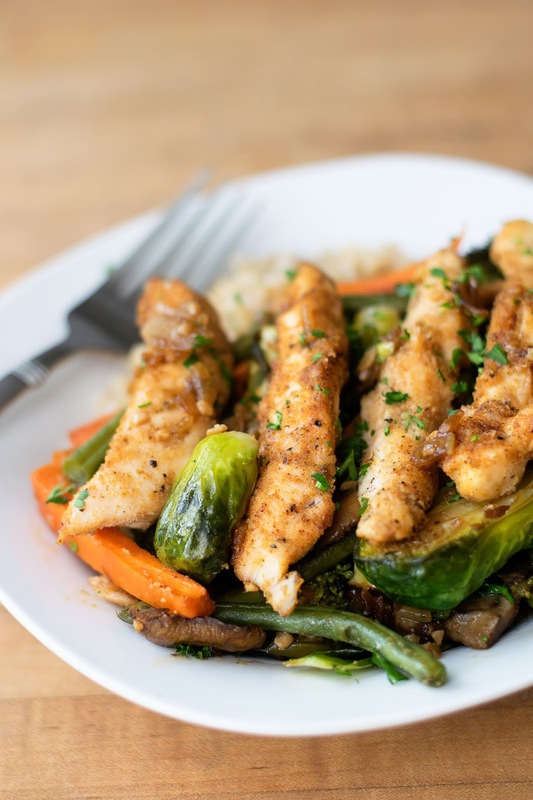 Place the chicken strips on top of the vegetables. Place into the preheated oven and bake for 30 minutes, stirring half way through. Oh, my, goodness, Mandee, this looks delicious!! One question: are the brussels sprouts cooked enough in the time allotted, or do they need additional time? I'm anxious to try this: great way to clean out the veggie bin in the refrigerator! Love your recipes, by the way. Hey Rosie! Thanks for the question. Yes, the sprouts are perfectly cooked! I would called them al dente. This was amazing! I love easy and delicious recipes! I check your blog each week when I'm doing my meal plans. Oh YAY! I'm so glad you liked it Cari!!! Thanks so much for all the support!